Advantages: Beautifully restrained surface features; high level of detail; positionable ailerons and rudder; solid and straightforward engineering; crystal clear and thin transparencies; centreline ventral gun pod is included (but marked as "parts not used" in the instructions); large and impressive. 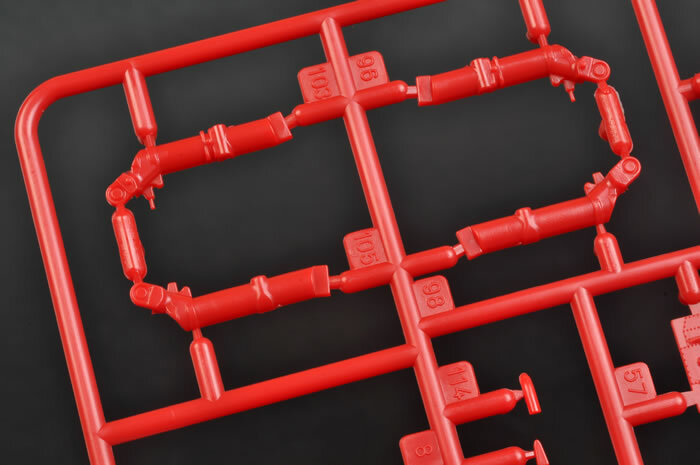 Disadvantages: Red plastic will take some covering. Conclusion: Revell's 1/32 scale Hawk T.1A is a straightforward but well-detailed kit with many interesting opportunities for colours and markings. Let's hope that Revell brings us more of this successful family of trainers and strike aircraft. At well under £20, it is also spectacularly good value for money! The BAe Hawk first entered service as a trainer with the Royal Air Force in 1976. Before long, an armed version of the Hawk was intriduced with a centreline ventral gun pod and provision for rocket pods, Sidewinder missiles or bombs. In the last three decades, the Hawk has been a major success story both in service with the RAF and the Royal Navy, and as an export to many countries in the roles of trainer, fighter and strike aircraft. The RAF's famous Red Arrows aerobatic team was formed in March 1965. They adopted the Hawk as their demonstration aircraft in 1980. In addition to their characteristic red scheme, the Red Arrows Hawks are also fitted with a centreline ventral tank carrying diesel oil and red and blue dye to leave a colourful trail during their aerobatic demonstrations. 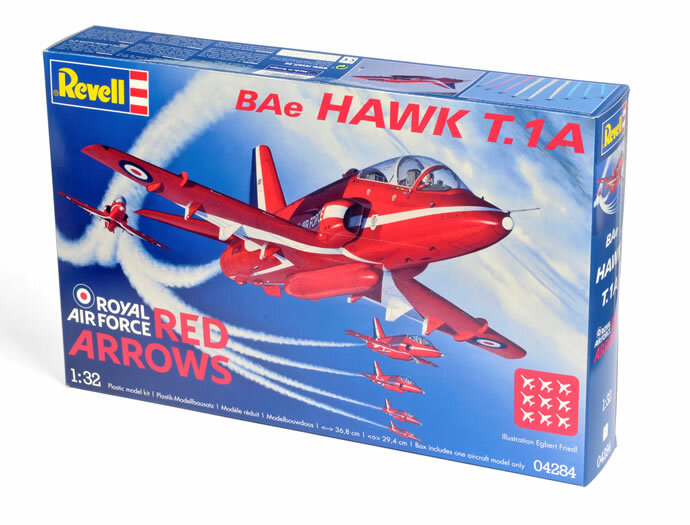 Revell's all-new 1/32 scale BAe Hawk T.1A Royal Air Force Red Arrows comprises 143 parts in red plastic, 12 parts in clear and markings for two aircraft, all packed tightly into a side-opening box. 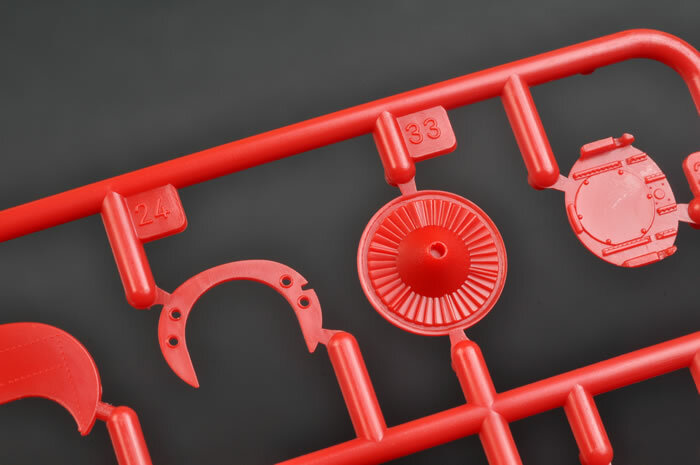 The first thing to grab your attention when sliding the parts from the box is the bright red colour of the plastic. Surface features are admirably restrained throughout. 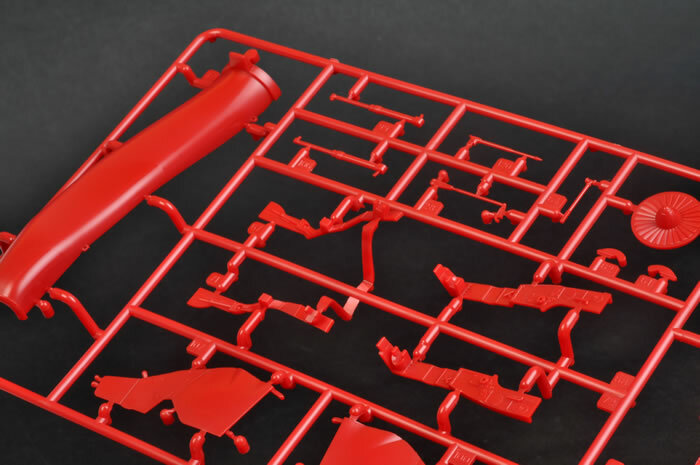 Panel lines are fine, crisply recessed and consistent. Vents and other structural details are depicted correctly. The cockpit and wheel wells are nicely detailed. 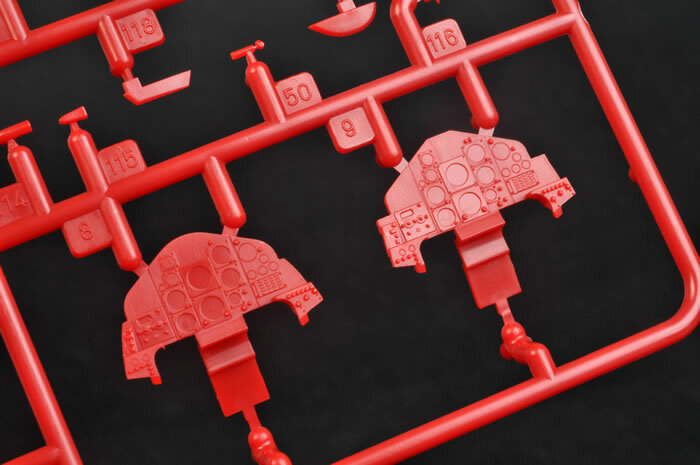 The instrument panels appear a bit plain on the sprues, but in combination with the decal dials supplied on the kit decal sheet, they look fantastic when finished. The decal harness straps are not quite so convincing. You might try cutting them out and keeping the paper backing in place to give them a little bulk and flexibility, or apply them to lead foil. I will probably either make my own harness straps or wait for Eduard to release their photo-etched cockpit upgrade - it is only a matter of time! The seats could do with some chute drogue detail at the top end, but otherwise they look good. 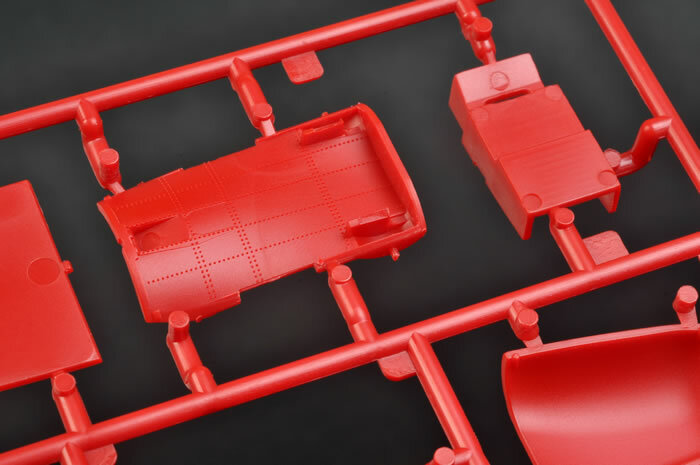 All this lovely detail will be very visible under the Hawk's big canopy, and what a canopy it is. 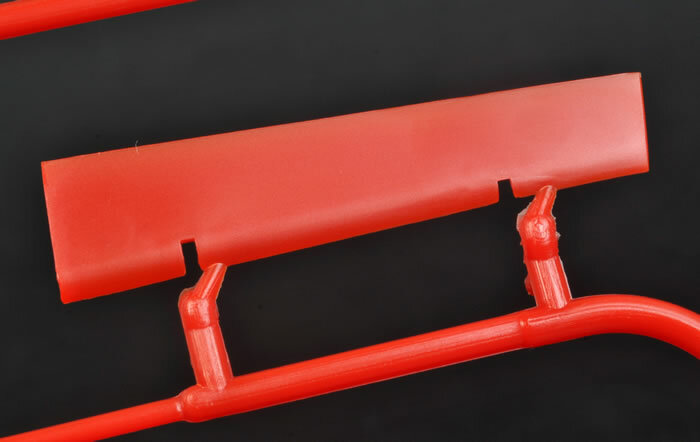 There is no centreline seam to be removed, and all the clear parts are thin and free from distortion. The big opening section is especially impressive. A decal for the det cord is also supplied. I will be dipping my canopy in Future and applying this decal on the inside. 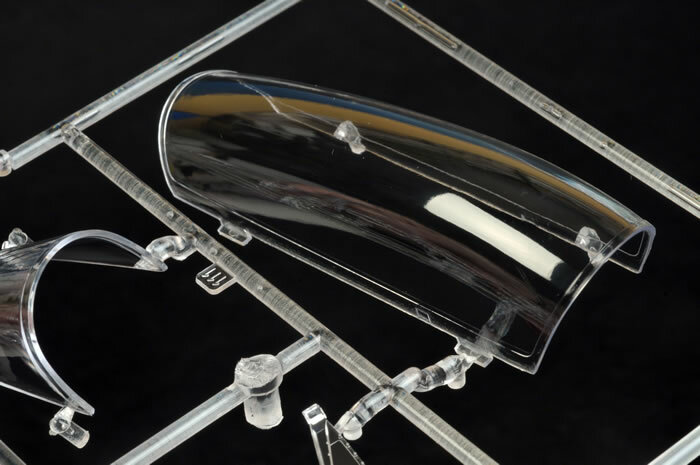 Other clear parts include the transparent cockpit divider, wing tip navigation lights and the nose landing light. Jet intakes are nice and long. They meet a fan face at the end. The jet pipe is suitably substantial too. The multi-part landing gear looks great. 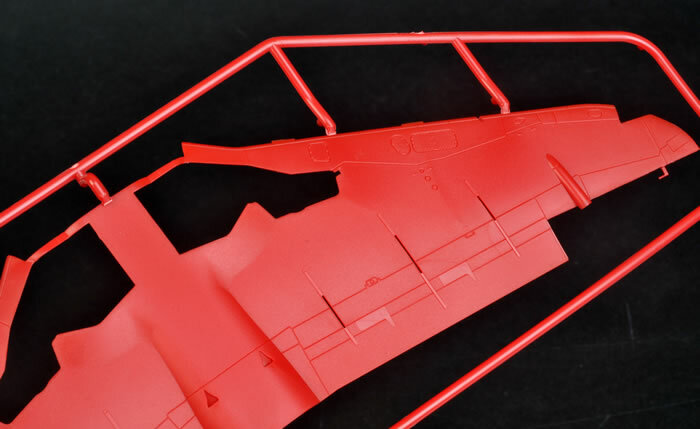 Ailerons and the rudder are supplied as separate poseable parts. 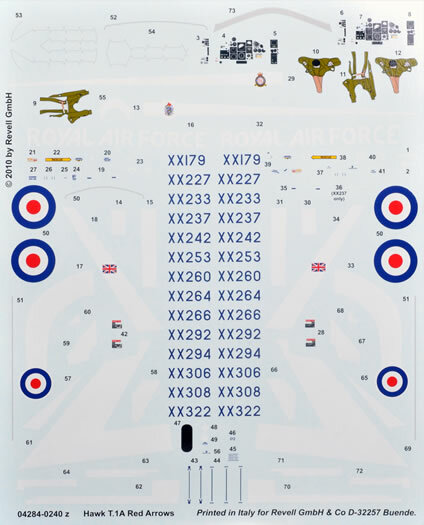 The Red Arrows' diesel and dye tank is included. 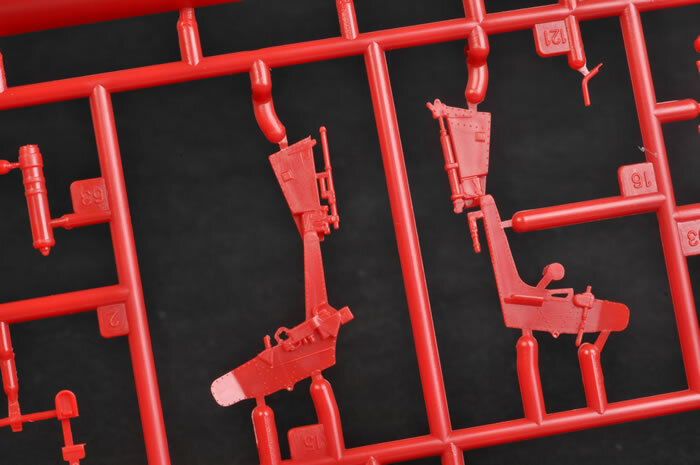 Although it is not intended for use on this version, the centreline ventral gun pack is on the sprues too (Parts 124 and 125, with the barrel being Part 126). This will be handy if you want to depict a camouflaged Hawk from the Tactical Weapons Units. 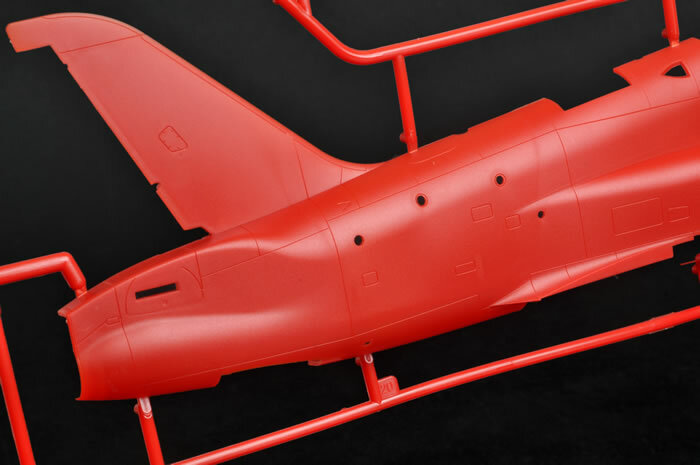 Two marking options are offered, both overall red Red Arrows machines with white trim. Decals are glossy, printed in perfect register and the colours look great. These are amongst the best Revell decals that I have seen. 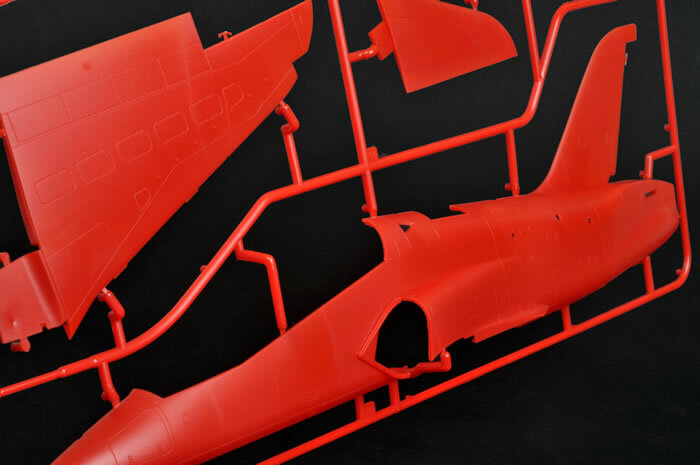 If you want to build something other than one of these Red Arrows machines, Xtradecal has already released a batch of aftermarket decal sheets offering a wide and colourful selection of alternative machines in red white and blue; wraparound grey and green, overall grey and black schemes; with even more in the pipeline. Replacement stencil markings are also available on a separate sheet. Six of these decal sets are available now from Hannants, with another four to be released in the near future. Revell's 1/32 scale Hawk T.1A is an impressive and well detailed kit at a remarkable price. Its modest parts count and conventional engineering will make this a relatively easy kit to build, but the large cockpit also lends all sorts of potential for the dedicated superdetailer. 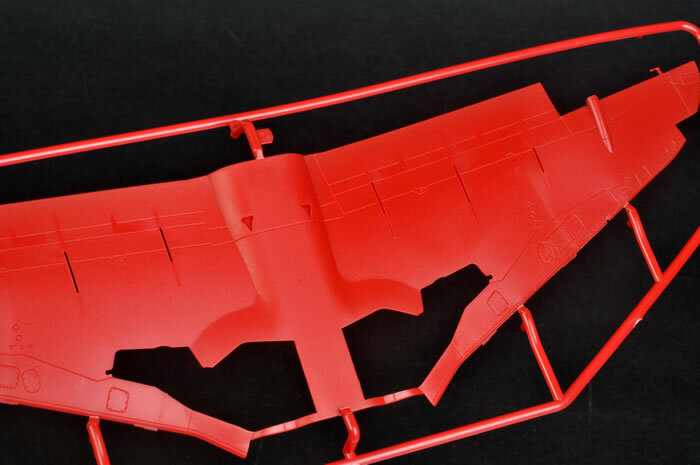 I am sure that nobody was particularly surprised that this initial Red Arrows release was moulded in bright red plastic, but red is notoriously difficult to paint over. I would strongly recommend applying a grey primer when each stage of sub-asssembly is complete prior to painting. 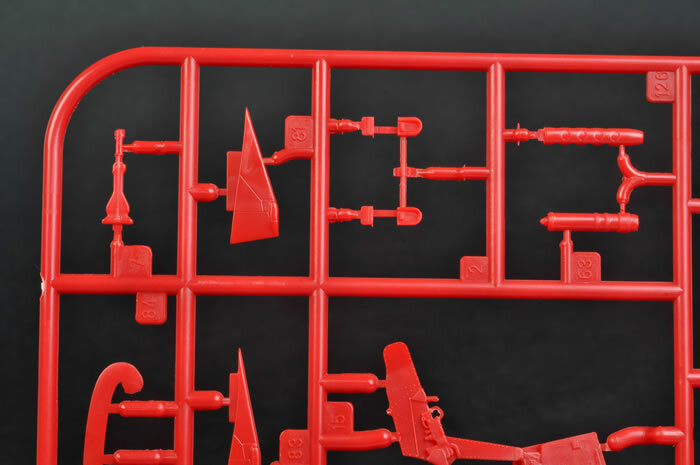 Having said that, I suspect that this initial release is targeted at a much larger market than we "serious" modellers; and that many of these attractive kits will find their way into the hands of impulse buyers and younger, less experienced modellers who may indeed leave the exterior in its unpainted red state. 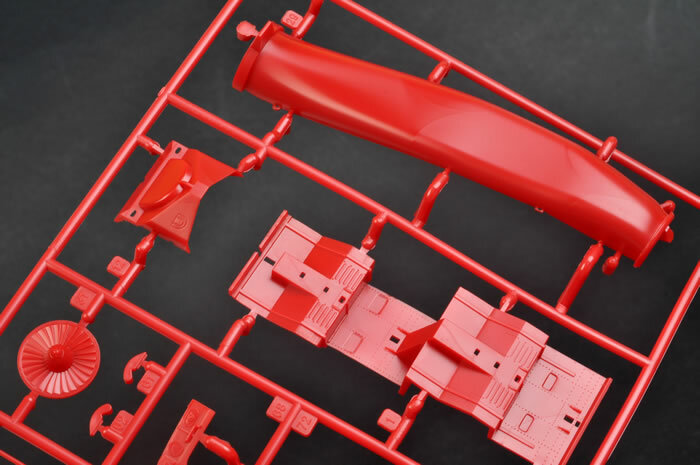 This is especially likely thanks to its bargain basement price, and also Revell's marketing strategy of initially releasing the kit in a British department store some weeks before it was available in hobby shops. 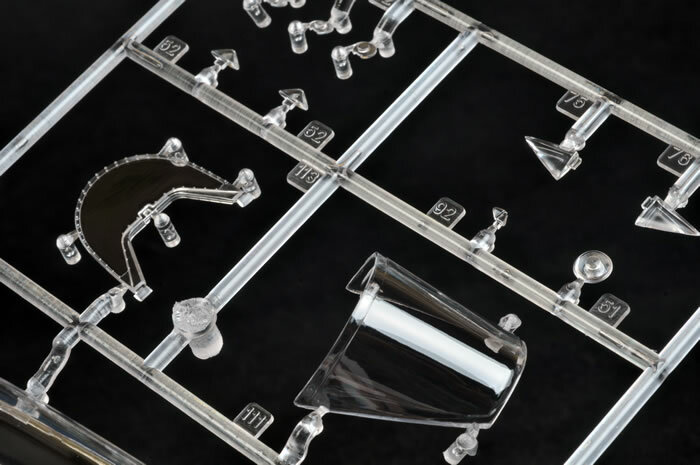 Hopefully, such a nice kit will encourage first-time purchasers to pick up another model and become hooked on the hobby. 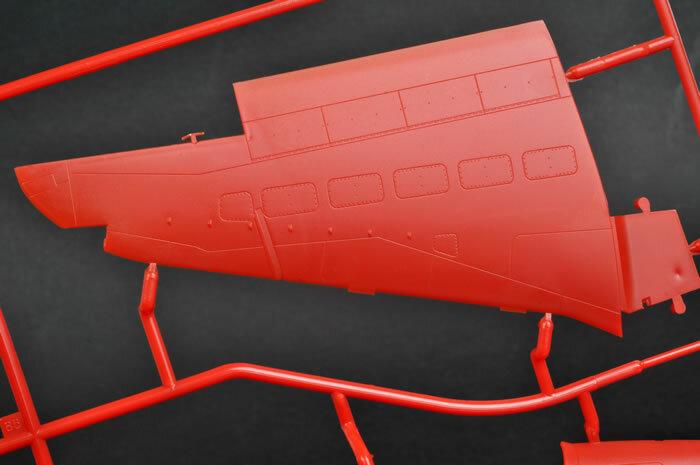 For the rest of us, there are already plenty of after-market marking options available thanks to Xtradecal, and we will undoubtedly start seeing resin and photo-etched weapons, ladders, intake covers and other upgrades appeaing soon. My only mild nitpick is that I think the parts would be safer if they were less compressed in a slightly larger, top opening box. 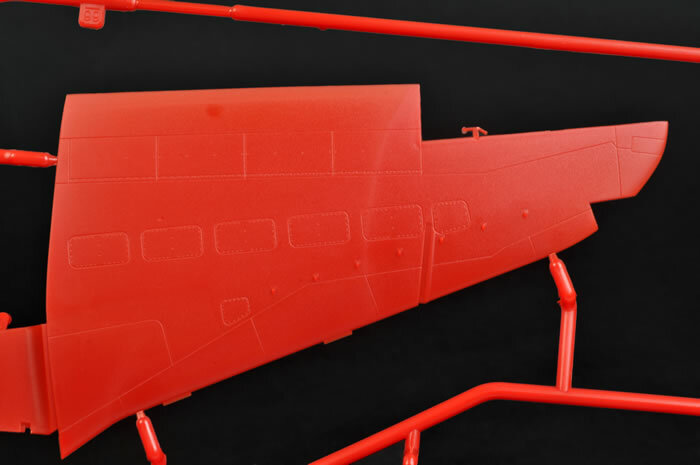 This is another welcome release from Revell, who are fast becoming the budget king of large scale aircraft modelling!